Who knew that we Conservative-led Britain would be leading in the leg-on-show stakes at our Fashion Week? New York has gone all shy on us, their collections were all below the knee with high neck lines. Over here, our shows took lots of inspiration from the brewing late 1960s theme (thank you, Jean Shrimpton) with shorter hemlines and little baby-doll themed dresses. Though the styles varied, the idea didn't - and the idea was simple: leg. The above designs all went for the same theme - letting the leg do the talking and not mixing it with any strong patterns. Below was a different story - with complex silk painted prints, and/or brights taking over the pieces. Black was a constant theme, as it was in New York to be fair... Your little black dress is going to play a big helping in hand for you this autumn. Sportsluxe necks are still around, as were texture mix ups with leather - lace also played a heavy role in London Fashion Week this year. The most important thing with this look is quite obvious - dare to bare. Don't bury yourself under a long jacket or coat this season - you'll need to invest in some thermal underwear as your legs will be out all year in 2012... My personal favourites are from J JS Lee (love that pale yellow) and Topshop Unique (still can't give up my love of a leather arm...). 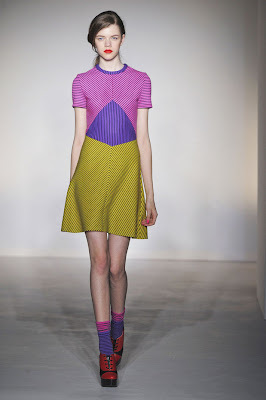 I just love House of Holland and Holly Fulton!